For a long time, I have felt lucky not only to have been born into a family of writers, but to have married into another. I also feel fortunate in being able to count many talented writers among my friends. 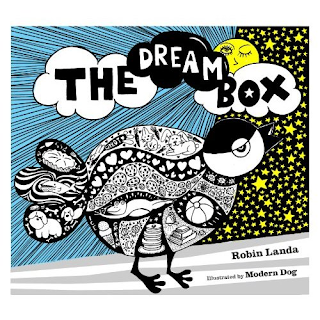 Robin Landa, the author of The Dream Box, a children’s picture book, is one of them. The Dream Box tells the story of Alex, a bird who is determined “to stay awake forever” after he is troubled by a series of bad dreams. When his mother’s and grandmother’s advice to think of “nice things” and have “happy thoughts” fails to do the trick, Alex can barely keep his eyes open in school or at home. Just in time, he finds a Dream Box on his bed, designed to get rid of nightmares permanently. Could his Aunt Dee have left it behind? By following the directions that come with the box, Alex is finally able to get a good night’s sleep! Ms. Landa’s imaginative and reassuring prose is accompanied by inventive illustrations from the Modern Dog Design Company. The book also includes a template and suggestions for young readers who want to make their own Dream Box. Every child who’s ever had nightmares (and every parent who’s tried to help) should have this book and use its technique. For now, The Dream Box is available only on iTunes or as an ebook from Amazon. Robin Landa is also the author of several books on advertising and graphic design, as well as Take a Line for a Walk: A Creativity Journal, a book that invites people of all ages and abilities to pick up a pencil or pen and start drawing. This sounds wonderful! Many times in my life, I could have used a dream box. I'm sorry this book is not in hard copy format, so I could see it at the library. Incidentally, the author's last name was once my email address.